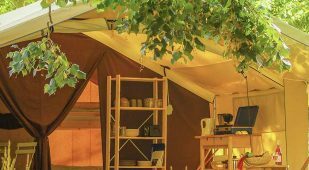 For simple pleasures and getting back to basics, CosyCamp offers an exceptional glamping holiday experience in a 4.5-hectare botanical garden, all in a car-free campsite. On the banks of the wild Loire River, in Southern Auvergne in France, just 90 minutes from Lyon, you’ll feel like you’re on the edge of the world. In a beautiful landscape of rocky cliffs, enjoy a comfortable stay in our luxury, unusual and original accommodation. The large camping pitches are perfect for glamping enthusiasts looking to set up the camp of their dreams. But what exactly is glamping? It’s the new trend in camping, but even more than that, it’s an eco-chic way of life. 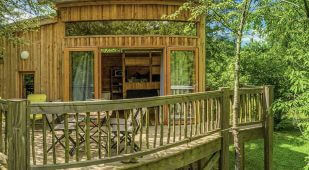 Glamping is a clever mix of luxury camping and nature, of comfort and ecology, of respect and nature. It’s also a contraction of GLAMOUR and CAMPING, it’s glamping! CosyCamp is a campsite without a fixed entertainment programme, but it’s still paradise for kids. There’s no karaoke here at CosyCamp: instead we light a campfire at nightfall! We have an environmentally-friendly approach to camping, and choosing to holiday at CosyCamp means sharing in our philosophy. CosyCamp is above all a small-scale campsite, where nothing is off limits, since we have confidence in our campers. We enjoy talking with guests and meeting new people in a friendly setting. There’s a special kind of atmosphere here. At CosyCamp, enjoy our new, comfortable, quality facilities and our eco-designed buildings, made with wood and volcanic stone to perfectly blend into the surrounding environment. The heart of the campsite is our Family Room: a large meeting area for all ages. A place to get together, talk, read or connect. Our bar and restaurant are also here, serving organic, seasonal cuisine from short food supply chains through partnerships with local farmers and producers. Relax in our heated outdoor swimming pools and, for your well-being, there’s an indoor pool with whirlpool baths and a massage service. The toilet blocks are new and modern and heated during the off-season. There’s also a baby area and a launderette. 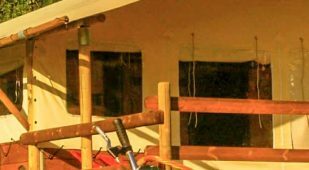 We provide our guests with canoes, bikes for kids, books and outdoor games, all free of charge. The treehouses and caravans are straight out of your imagination. From the terrace of your Safari Lodge or Cottage, enjoy views of the ruins of Artias Castle. What to do in a Hut or a Robinson Tent? Relax and find your inner child! These fun, comfortable and unique accommodations are perfect for a romantic getaway or a family holiday. CosyCamp not only has unique accommodation, we’re also a real campsite in Auvergne, France. 2/3 of our pitches are reserved for traditional camping: tents, motorhomes, campervans, caravans or trailers. At CosyCamp, rediscover the Art of Camping: simple comforts in harmony with nature. Here, there are no cars to take up space! Aren’t camping holidays meant to be a break from your daily life and your routine? Discover a new way of living for a few days! Discover eco-chic camping at CosyCamp. We’re a small campsite, but with large, quality swimming pools and facilities. Are swimming and bathing a must for your relaxing holiday experience? Here, you can swim all year long, no matter what the weather, in our two outdoor heated swimming pools, as well as our smaller, 15m² indoor heated pool. 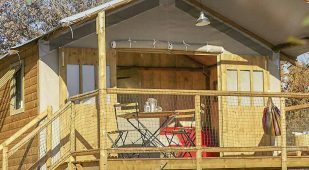 CosyCamp is on the banks of the wild Loire River. In front of the campsite, along pebble beaches, the river widens and slows down for a calm, safe wild swimming hole for families. On its way from the nearby source to the campsite, the Loire is shallow and quickly heated by the pebbles. The temperature of the swimming area in the summer easily reaches a pleasant 24 to 25°C. The water is deeper on the opposite bank under the steep basalt cliffs that rise sharply from the river. Perfect for fans of wild swimming or for river jumping or diving. CosyCamp is a big, eco-friendly garden. Set up camp in a true conservatory of gardens, crops and orchards. All our gardens are both fun and educational. How can camping without an entertainment programme be such a paradise for both kids and adults? First of all, because there are no cars. Parents are at ease, and there’s a feeling of freedom at the campsite. In keeping with the spirit of the campsite, we offer plenty of free services and amenities. For example, we provide bikes, canoes, outdoor games and more, all free of charge. We also have hotel amenities and a four-star service to ensure you have a pleasant stay. Auvergne in France, with its pure sources, quality local products, iconic volcanoes and friendly locals is a perfect place for recharging your batteries. Our region rejuvenates the body and the mind. Come and see for yourself!